Last updated by suzlipman at February 2, 2019 . Spring! These flowering trees were in complete and colorful bloom during my recent visit to Olympia, Washington. I was very taken with their bright and cheerful colors and the way the trees set off the mid-century ranch homes and the colorful board-and-batten homes in suburban southwest Olympia, where my daughter lives while attending The Evergreen State College. The visit coincided with Earth Day (and Olympia’s Procession of the Species parade, to honor our planet and its inhabitants), as well as the 44th annual Arbor Day, which celebrates and promotes caring for our vital trees. Want to learn about trees all year round? Check out this Tree Toolkit from the National Environmental Education Foundation, for terrific lessons and resources. How many trees can you identify, just from their flowers? Take this fun tree quiz from Mother Nature Network. Want to spend more time with your local trees? Get out to a park today or during National Park Trust‘s Kids to Parks Day May 21. You’ll find lots of resources on their site for fun park and tree activities, as well as events you can join on Kids to Parks Day. Happy Arbor Day and Spring! Update for 2019: Punxsutawney Phil did not his shadow today, which predicts an early spring! Groundhog Day, February 2, has basically everything going for it that I love in a holiday – It marks a point in a season; it’s full of folklore and wisdom, superstition, ceremony, civic charm, science, mystery, agrarian history, and weather – and it was featured in perhaps my all-time favorite movie of the same name, which itself is a study in acceptance and inner calm while being outright hilarious in nearly every frame. Altogether now: It’s Groundhog Day! In an early morning ceremony, groundhog Punxsutawney Phil will rise from his heated burrow at Gobbler’s Knob, PA, as he has for 128 years, and signal to his handlers whether or not he sees his shadow. No shadow means an early end to winter. And if the groundhog does see his shadow? Six more long weeks of the season. Over the past years that the ceremony has taken place, Phil has seen his shadow 102 times and not seen it only 17. (Records don’t exist for every year.) In 2008, the crowd heartily booed the prospect of “six more weeks of winter”, as I suspect they would do this year, as well, should Phil call for even more chilly weather. Some have stated that Phil’s “handlers” make the prediction for him. What do we think of that? According to this excellent Groundhog Day site, German settlers arrived in the 1700s in the area of Pennsylvania, northeast of Pittsburgh, which had been previously settled by the Delaware Native Americans. The Germans celebrated Candlemas Day, originally a Medieval Catholic holiday to mark the mid-point between the Winter Solstice and the Spring Equinox in the Northern Hemisphere. The holiday also has roots in Celtic-Gaelic and Pagan cultures, where it is celebrated as St. Brigid’s Day and Imbolc, and is a time of festivals, feasting, parades, and weather prediction, as well as candles and even bonfires to mark the sun’s return. According to Wikipedia, the origin of the word “Imbolc” is “in the belly”, and among agrarian people, Imbolc was associated with the onset of lactation of ewes, which would soon give birth to lambs in the spring. These are some really weather activities to help kids understand about temperature, air pressure, wind and much more. Do groundhogs really emerge from their burrows to see their shadows? Yes, and no. Male groundhogs actually emerge in search of females, who have emerged just prior. Once the female is sighted, the male groundhog actually goes back into his underground man-cave to wait out the cold weather, confident that a female is near. On the flat surface of the ground. Punxsutawney’s first Groundhog Day celebration was in 1886, and though other towns, particularly in the eastern U.S., have Groundhog Day ceremonies – Staten Island Chuck, anyone? – none is nearly as famous as Punxsutawney’s. Some of this may lie with the groundhog’s official name, “Punxsutawney Phil, Seer of Seers, Sage of Sages, Prognosticator of Prognosticators, and Weather Prophet Extraordinary”. Still more popularity, and tourists, have come as a result of the movie Groundhog Day. The first official Groundhog Day prediction in Punxsutawney? No shadow – early Spring. 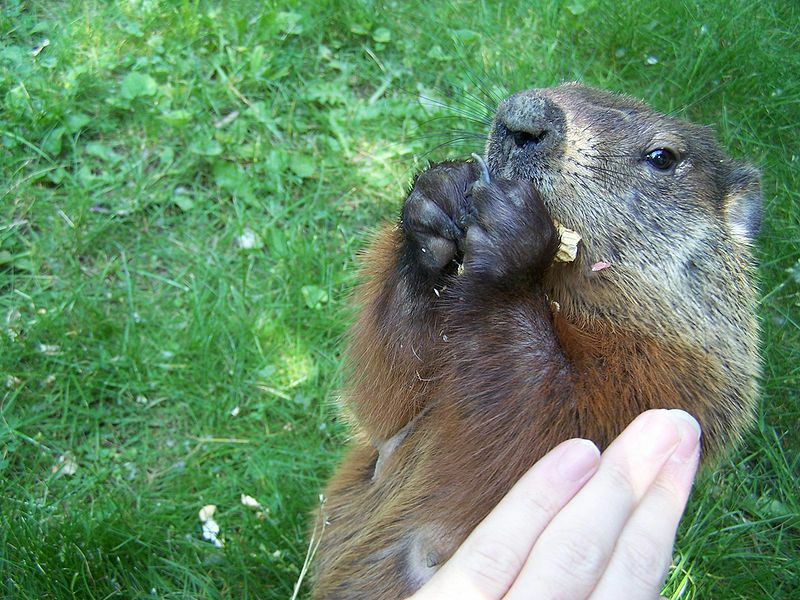 This site has more information about the groundhog itself and about the filming of the movie. If you are a Groundhog Day movie obsessive like me, you will enjoy this site that breaks down exactly how long Bill Murray’s character, Phil the Weatherman, experiences Groundhog Day in Gobbler’s Knob. Rabbit—Make a fist with one hand. Place the other palm over it and make a peace sign (for ears) with two fingers. Hawk—Link your thumbs together, with your hands facing away from you. Stretch out your fingers and hands and flutter them like wings. Spider—With palms facing up, cross your hands at the wrist. Press your thumbs together to form the spider’s head. Wiggle your fingers in a climbing motion. Wolf or dog—Place your palms together, fingers facing outward. Put your thumbs up to form ears. Let your pinkie drop to form a mouth. Bend your index fingers to create a forehead. Camel—Lift one arm. Hold your hand in a loosely curved position. Hold the pinkie and ring finger together. Hold the other two fingers together, thumb pressed in. Curve both sets of fingers and hold them wide apart to form a mouth. Your arm, from the elbow up, will be the camel’s neck. There are also a lot of very appealing shadow and groundhog crafts for Groundhog Day, like the one below from Mrs. Ricca’s Kindergarten and a great round-up of others from Motherhood on a Dime. Shadow or no, here’s wishing you a happy remainder of the winter, a ceremony or two, a dash of lore and wonder, and a fruitful spring. Shadow puppets adapted from FED UP WITH FRENZY: Slow Parenting in a Fast-Moving World, which contains 300+ fun family activities. Around the world, people who live in the Northern Hemisphere celebrate the mid-point between the Winter Solstice and the Spring Equinox. In countries that use lunar calendars to determine festival days (many of which are in Asia and the Middle East), this signals the beginning of the new year and the first stirrings of spring. There are lots of ways to honor and celebrate various midwinter traditions that are delightful, educational and bring families together. The Chinese Lunar New Year begins on February 8th this year, and marks the beginning of the Chinese year 4714. The Chinese Lunar New Year traditionally begins at the first new moon after January 21st. Each year is said to be represented by one of 12 animals in the Chinese Zodiac. This coming year is the Year of the Monkey. San Francisco is host to the largest Chinese New Year Parade outside Asia and one of the few illuminated nighttime parades in the world. The parade, Feb. 20th this year, dates back to 1860 and features more than 100 groups, including extravagant lion dancers and a 200-foot-long Golden Dragon. San Francisco’s Chinatown offers numerous other free events and activities throughout the two-week New Years celebration, such as lion dance exhibits, and craft activities like making lucky red envelopes, at city libraries. In New York City, the New York City Chinese New Year Parade and Festival takes place Feb. 14th this year, and winds through the streets of Little Italy and Chinatown. There’s also a Firecracker Ceremony and Cultural Festival on Feb. 10th, with drumming, dancing, and more than 600,000 firecrackers, the noise of which is said to ring out the evil spirits of the old year and ease what many viewed as a vulnerable transition between years. Read more about the tradition of greeting the new year with noise and how to make your own noisemakers. In Chicago? Attend the Chicago Chinatown Lunar New Year Parade in their vibrant Chinatown and experience marching bands, floats, lion dancers and a dragon dance, on Feb. 14th. Here are some great photos of Chinese New Year celebrations around the world. Here are more Chinese New Year crafts and recipes. The Jewish holiday Tu B’Shevat, which occurs in mid-winter in the Northern Hemisphere (sundown, January 24th, this year) is known as the New Year of the Trees and, in some circles, the Jewish Earth Day. Its date coincides with the earliest blooming trees in Israel and it is celebrated by planting trees and plants and by eating tree fruits and nuts. For our family, celebrating Tu B’Shevat represents a way to honor the turning of the year, welcome the promise of spring and new life, and recommit to caring for the nature around us. Looking for a meaningful way to celebrate Tu B’Shevat? Consider planting a tree or seeds, or choosing a natural area to steward by weeding or picking up trash. Take a nature walk and observe what you see, or make a homemade bird feeder, so you can help the birds at a point in winter when much of their food supply has diminished. Here are lots more traditions, blessings and activities to celebrate the New Year of the Trees. 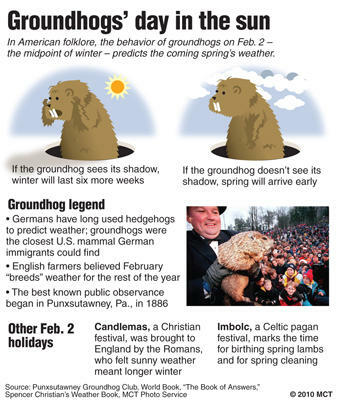 Pennsylvania’s German settlers believed that if the weather was fair on Candlemas Day (causing the groundhog to see his shadow), then the second half of winter would be stormy and cold, producing “six more weeks of winter.” This site explains the science of Groundhog Day and the fact that cloudy weather is actually milder than clear, cold weather. Groundhog Day was first celebrated in the U.S. in 1886 and featured a groundhog named “Punxsutawney Phil”, the same name of the groundhog that makes predictions today. To celebrate Groundhog Day, try making hand shadow puppets, having a friend trace your shadow, or enjoying one of these shadow-themed activities or weather experiments. Here is a lot more science, lore, activities and fun for Groundhog Day. Japanese people celebrate Setsubun (Feb. 3rd this year), traditionally the beginning of spring, with a bean-throwing ceremony called Mame-maki. Beans are thrown indoors and then outside, as people shout, “Oni wa soto! Fuku wa uchi!” (“Out with the devil! In with fortune!”), to drive away the evil spirits, a tradition that is a carry-over from mame-maki’s origins as a New Year’s ritual. Sometimes fathers dress up as the oni (devil). It’s considered good luck to eat the number of beans as your age. You may want to do some Setsubun crafts. Enjoy your celebration of midwinter. Hopefully it won’t feel like too long a wait until spring. The Jewish holiday Tu B’Shevat, which occurs in mid-winter in the Northern Hemisphere (sundown, January 24th, 2016) is known as the New Year of the Trees and, in some circles, as the Jewish Earth Day. Its date coincides with the earliest blooming trees in Israel and it is celebrated by planting trees and plants and by eating the fruits and nuts of trees. For our family, celebrating Tu B’Shevat represents a way to honor the turning of the year, welcome the promise of spring and new life, and recommit to caring for the land and the planet. Here are some easy, fun and meaningful ways to celebrate Tu B’Shevat. Planting a tree is a simple and powerful act of faith and stewardship. Even a small yard or balcony can often accommodate a dwarf or potted tree. Alternately, there may be a neighborhood or public space available for the planting. This is a great project for a school, scout or youth group, as well as a family. Some people plant trees in the same place each year and watch them grow over the years. See Blessings and Poems for Trees below. No space for a tree? No problem! Plant seeds outdoors or indoors that will come up in spring. You may want to plant parsley for Passover or Easter, peas for Earth Day, cosmos for May Day, or pansies for Mother’s Day. Of course, anything that grows will be celebrated anytime. Try these easy-to-plant seeds, which can be planted in cool weather, are large enough for little fingers to handle, and sprout and grow relatively quickly: beans, gourds, morning glory, nasturtiums and peas. Sometimes the act of recording your observations with a camera or journal causes you to look around in a different way and notice things and make connections that you might not have made otherwise. Photography and poetry can help us quiet ourselves and focus our time in nature. Choose an area near your home to care for for a few hours, in the form of weeding or picking up trash. These simple activities can really deepen our connections to the nature, as well as the people, around us. This can be especially true if we plant and revisit the same tree, or repeatedly care for the same piece of “nearby nature” over the years. Did you know that orange halves make great bird feeders? They’re simple to make, visually appealing and even biodegradable. Best, your orange bird feeder will help you help the birds, at precisely the time when much of their food supply has diminished. For those familiar with a Passover seder, a Tu B’Shevat seder is simpler. There are few rules. Hosts and participants decide on the customs that suit the event. Some plant seeds and tell stories that involve trees and tree planting. Others eat plenty of fruit and perhaps only fruit. You may want to choose from or eat all of these seven species which are abundant in Israel: wheat, barley, grapes, figs, pomegranates, olives and dates. For many, the roots of a plant can be just as fascinating as the parts we see above ground. This simple root viewer lets budding botanists view the magical processes that happen below the surface of growing things. Fill the containers most of the way with dirt. Plant the seeds close to one side, one or two per cup. Put them in the sun and water gently. Watch as roots form and plants sprout. At tree-planting time, you may want to recite a blessing or poem to encourage a long life for the tree. If you’d like, pass a chalice of water and have each person who receives it share a wish, thought or memory. Once the chalice has gone around, the water can be used to nourish the tree. We plant this tree to honor ______ (name of person or occasion). May this tree’s roots go deep, its trunk grow strong, its branches spread wide, and its leaves and fruit provide nourishment, beauty and shade. May it always remind us of this special moment. In years ahead, I’ll grow so tall! I will soon be way up there! Then my trunk starts making leaves. Leaves on my branches will make food. And I’ll grow more bark outside! Losing my leaves when it is fall. But when it is spring, new leaves will show. How do trees grow? Now you know! Slow Snippet: In old Jewish homes, a cedar tree was planted for each baby boy, and a cypress tree for each girl. When two people married, branches from their trees were used to create their “chuppah”, or wedding canopy. Hope you have joyous Tu B’Shevat! Many of these activities are adapted from Fed Up with Frenzy: Slow Parenting in a Fast-Moving World, which contains 300+ activities for family fun. Groundhog Day, February 2, has basically everything going for it that I love in a holiday — It marks a point in a season; it’s full of folklore and wisdom, superstition, ceremony, civic charm, science, mystery, agrarian history, and weather — and it was featured in perhaps my all-time favorite movie of the same name, which itself is a study in acceptance and inner calm while being outright hilarious in nearly every frame. In an early morning ceremony, groundhog Punxsutawney Phil will rise from his heated burrow at Gobbler’s Knob, PA, as he has for 127 years, and signal to his handlers whether or not he sees his shadow. No shadow means an early end to winter. And if the groundhog does see his shadow? Six more long weeks of the season. Over the years that the ceremony has taken place, Phil has seen his shadow 101 times and not seen it only 17. (Records don’t exist for every year.) In 2008, the crowd heartily booed the prospect of “six more weeks of winter”, as I suspect they would do this year, as well, should Phil call for even more chilly weather. Punxsutawney’s first Groundhog Day celebration was in 1886, and though other towns, particularly in the eastern U.S., have Groundhog Day ceremonies — Staten Island Chuck, anyone? — none is nearly as famous as Punxsutawney’s. Some of this may lie with the groundhog’s official name, “Punxsutawney Phil, Seer of Seers, Sage of Sages, Prognosticator of Prognosticators, and Weather Prophet Extraordinary”. Still more popularity, and tourists, have come as a result of the movie Groundhog Day. The first official Groundhog Day prediction in Punxsutawney? No shadow – early Spring. We didn’t initially intend to hike five miles from our house to Muir Woods National Monument and back, but the first day of spring arrived quite beautifully and, inspired by the new book, We Love Nature! A Keepsake Journal for Families Who Love to Explore the Outdoors, by Stacy Tornio and Ken Keffer (illustrated by Denise Holmes), my daughter and I set off on a pretty and hilly local trail. We loved the idea of welcoming the season with a hike, as well as the notion of leaving right from our house and walking to the trail head. We thought we’d walk one way, and had arranged for a pick-up at the end of the walk. Keffer and Tornio are the authors of The Kids’ Outdoor Adventure Book, reviewed here last year, and their new book, which delightfully arrived in time for spring, expands nicely on their theme of providing easy ideas that families and others can use to create their own nature adventures. The book serves as a journal, as well, with questions that prompt readers to think, write and draw about their nature time. Our first-choice activity from the book? “Hike on a trail near your home and write about what you discover.” We added some photos as well. Anna and me, setting off on our adventure. Pride of Madeira plants were sighted while climbing our first hill out of our neighborhood. A kind and creative homeowner shows the way to the Dipsea Trail, a trail that winds seven miles from a canyon in our town of Mill Valley, CA, to the sea at Stinson Beach. We will take the Dipsea partway. We entered Mt. Tamalpais State Park. Anna is at the precipice, eyeing the trail below. We descended into canyons of ferns, redwoods and bay trees. We spotted a spectacular Douglas Iris. And a Beach Morning Glory. We made it to the Muir Woods, about 2.5 miles from the start, feeling pretty accomplished. Muir Woods has lovely creeks running through it that are home to spawning salmon. Muir Woods is also home to thousands of old-growth coast redwoods, the tallest living things in the world. This redwood fell on Winter Solstice, 2012. A sign nearby told us that it was an elder that had had a good life and deserved respect. Tired, but also reenergized from being in the beautiful woods, we traced our steps back toward home. The hikers, five hours and a great adventure later. Prompted by the book, and this hike, we immediately planned our next one! A few days later, we took the Dipsea Trail in the opposite direction than we had the first time and went into our town for a shorter (but stair-filled) loop walk. Later, we plan to keep going on the Dipsea Trail, past the Muir Woods to the ocean (and take someone up on that ride home). Design your yard and garden to be butterfly friendly. Reuse an object as a garden container. Find inspiration from nature, and then create a piece of art. Swim with your family or friends at a local lake, river or pond. Discover the night sky through stargazing. Would you like to win your own copy of We Love Nature! A Keepsake Journal for Families Who Love to Explore the Outdoors and a pair of KEEN shoes? Enter the Destination Nature giveaway today. Just in! Punxsutawney Phil saw his shadow. He predicted an six more weeks of winter on Groundhog Day. 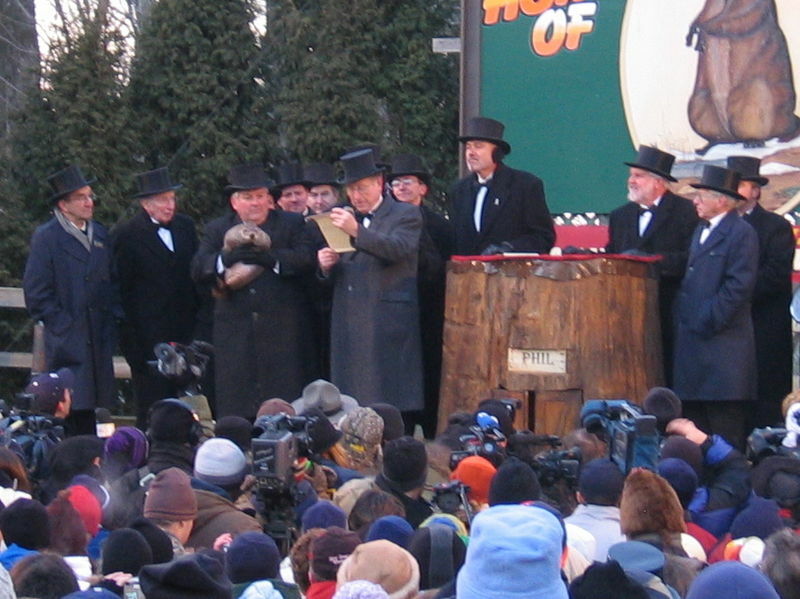 In an early morning ceremony, groundhog Punxsutawney Phil will rise from his heated burrow at Gobbler’s Knob, PA, as he has for 126 years, and signal to his handlers whether or not he sees his shadow. No shadow means an early end to winter. And if the groundhog does see his shadow? Six more long weeks of the season. Over the years that the ceremony has taken place, Phil has seen his shadow 100 times and not seen it only 17. (Records don’t exist for every year.) In 2008, the crowd heartily booed the prospect of “six more weeks of winter”, as I suspect they would do this year, as well, should Phil call for even more chilly weather. Brightly colored tissue- or crepe-paper flowers make a cheery gift or decoration for May Day, Mother’s Day or any time in spring and are a great way to fill a May basket. These are so easy to make, and the results are so pleasing, don’t be surprised if you end up creating a whole bouquet. Wrap floral tape around the dowel or tube, or paint it green and let dry. Layer 5-6 sheets of paper. Fold the pile accordion-style (the long way, if there is one), approx. 1” thick, if using standard sheets of tissue paper. Wrap a pipe cleaner or wire around the center of the papers, leaving two equal-length ends. If desired, cut the ends into round or jagged shapes to create decorative petals. Gently separate the layers of paper and fluff them until they are fairly evenly distributed. Attach the flower to the stem with pipe cleaners or wire. Note: Smaller flowers make great embellishments for gifts. Skip the stem and tape or tie flowers to gift wrapping or ribbon. This craft is adapted from Fed Up with Frenzy: Slow Parenting in a Fast-Moving World, which contains this and 300+ more fun family activities.